For most duck hunters – and I’m one of them – green is everything. As in the iridescent green of mallard drakes, greenheads as they are affectionately known by legions of duck hunters who covet their aerial presence over a decoy spread. Few things make a boy smile more than bagging his first greenhead. Above, Zach Burkhead shows off his first mallard drake taken on a recent hunt. In fact, one of my life’s most memorable moments was on a frigid gray January day near a Red River slough, a spot where my 20-gauge shot column finally connected with a mallard drake. When that drake crumpled to the ground below, I’m not sure I’ve ever had a bigger smile on my face than I did in that moment. Little has changed in the quarter century that has followed. Now mind you, I’m no duck snob who turns up his nose at taking other species. Over the years that I’ve been duck hunting, I’ve grown to love the appearance of pintails, wigeons, gadwalls, green-winged teal, and even divers over my spread. But I must also admit that no matter how successful a hunt has been, there is always just the slightest twinge of disappointment if a greenhead or two doesn’t grace the daily bag limit. Years ago, that was no problem. Grayson County might not have been ground zero for greenheads, but it wasn’t far off the mark thanks to the marsh like upper ends of Lake Texoma and the thousands of acres of peanuts being farmed locally. In fact, so high was the local goober production in years gone by that a couple of Grayson County farmers I’ve known down through the years have spun tales of so many mallards feeding in their family’s peanut fields each night that the babbling chuckles of these ducks made it difficult to sleep. A North Texas tall tale? Nope – I’ve seen the pictures they had to prove the surplus of green-headed ducks. By the time I started hunting in the 1980s, peanut farming was in slow decline but was still good enough that I was able to knock down plenty of greenheads whose craws were filled to the brim with crunchy peanuts. On some hunts, I bagged mallards who circled a drinking hole during the mid-morning hours after feeding in nearby sandy fields. On other hunts, I actually hunted the dry peanut fields themselves, taking mallards where there wasn’t any water for hundreds of yards around. But slightly more than a decade ago, the Grayson County peanut industry all but faded from this area, making the bagging of a limit of greenheads a more difficult chore than it had ever been in years gone by. 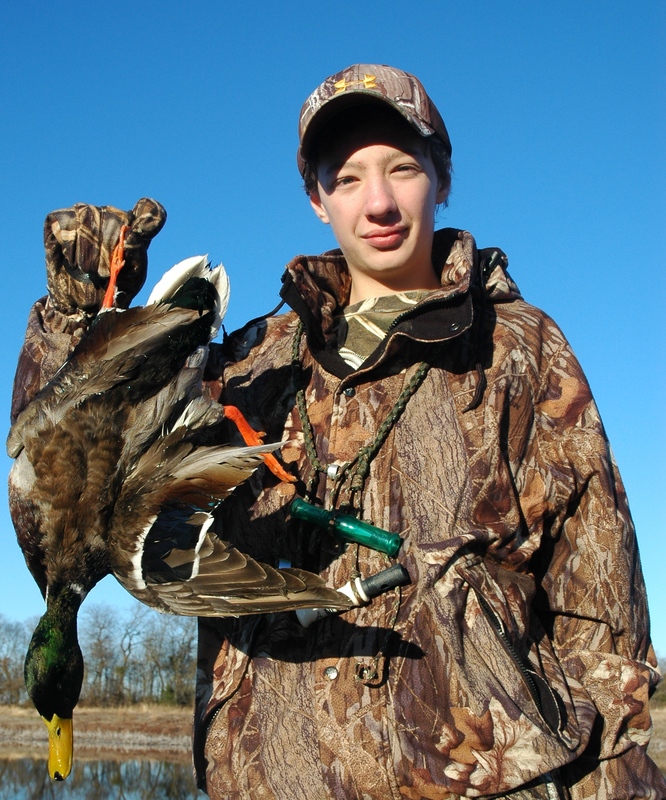 So much so that despite my best efforts – and several close calls – neither my oldest son Zach nor my youngest son Will had ever bagged a greenhead mallard on the waterfowling trips that we’ve shared together. There have been a number of other ducks – gadwalls, wigeon, teal, and divers – but not a greenhead for either Son 1 or Son 2. Last week when Zach spied a lone duck locked up and gliding into our spread from nearly 70 yards out. “A single coming in,” he whispered quietly while looking under the brim of his camo hat. When the mallard drake approached into shotgun range, Zach shouldered his 20-gauge and touched the trigger. Crumpling the greenhead into the decoy spread with a geyser spray of chilly water. And producing a smile that looked as big as the Grand Canyon itself. A familiar grin that a proud father quietly remembered from so many years ago. And now eagerly awaits the day when he sees the same smile on the face of his youngest son Will. So that the family waterfowl hunting circle of green will be complete.